Three professors were awarded the 2016 Association of Fundraising Professionals Skystone Partners Research Prize. 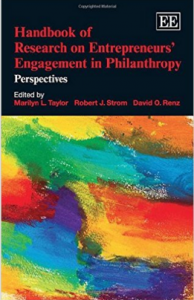 Marilyn Taylor, D.B.A., Arvin Gottlieb/Missouri Chair of Strategic Management; David Renz, Ph.D., Beth K. Smith/Missouri Chair in Nonprofit Leadership; and Robert Strom, Ph.D., Adjunct Instructor of Business Administration; received the prize for the book they wrote together, “Entrepreneurs’ Engagement in Philanthropy: Perspectives.” The group will receive the award at the March 2016 AFP International Conference on Funding. Members of the selection committee cited the trio’s publication because it exemplified the high standards of scholarship the prize’s originators sought to encourage. The prize is awarded to a group or author who makes a substantive contribution to knowledge and understanding of fundraising and/or philanthropic behavior; relevant insights for donors, grant makers or fundraisers; creativity and depth of analysis; and quality of style, readability and format. In a kickoff event on Oct. 19, the UMKC Henry W. Bloch School of Management and the Department of Public Affairs launched the Aaron L. Levitt Social Entrepreneurship Challenge. This fun new initiative is designed to develop social entrepreneurship and innovative civic leadership in the Greater Kansas City region as it enables the next generation of civic leaders and social entrepreneurs to serve our community. KANSAS CITY, Mo. – The city’s top business leaders and business educators gathered at the University of Missouri-Kansas City today to celebrate the university’s achievements in applying entrepreneurial practices to address social problems. 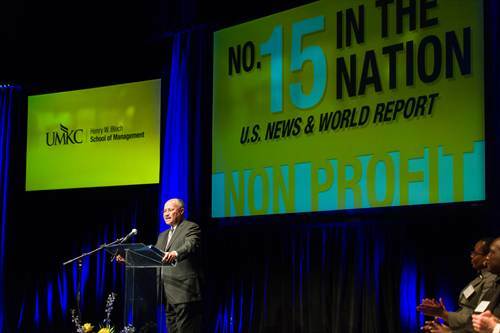 UMKC announced that in the recent U.S. News & World Report listing of “Best Graduate Schools 2013″ rankings, the nonprofit management emphasis in the Henry W. Bloch School of Management’s Master of Public Administration program jumped 10 spots from its former ranking at No. 25 to No. 15 in the nation. Frank Ellis, president and CEO, Swope Community Enterprises and chair of the Greater Kansas City Chamber of Commerce, makes the ranking announcement to guests. School namesake Henry W. Bloch said this represents achievement in “social entrepreneurship” and reflects his vision for the school that bears his name. 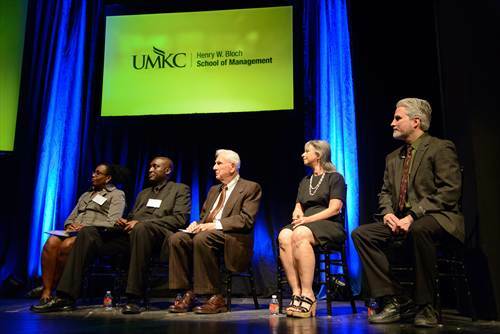 He was joined by Greater Kansas City Chamber of Commerce Chair Frank Ellis, Bloch School Dean Teng-Kee Tan, UMKC Chancellor Leo E. Morton and Department of Public Affairs Chair David Renz at the celebration, held at the university’s James C. Olson Performing Arts Center. According to Frank Ellis, the Greater Kansas City Chamber of Commerce reviewed dozens of submissions that addressed solutions to the City’s needs. “We are working on what we call the Big 5, each goal promising significant impact and each goal achievable. Fortunately, they align perfectly with existing programs in the Bloch School of Management,” said Ellis. Announced at the June 20 event, the Aaron L. Levitt Social Entrepreneurship Challenge allows students from across UMKC to compete in developing innovative strategies that address some of the most complex urban community needs and challenges. This is similar to the Regnier Venture Creation Challenge – a UMKC competition designed to encourage venture creation by students, where the new venture concepts are presented to business leaders, investors and entrepreneurs. The Master of Public Administration program is housed within the Bloch School’s Department of Public Affairs, which also is home to the Midwest Center for Nonprofit Leadership, a nationally recognized community leadership development center; and the L.P. Cookingham Institute for Urban Affairs, which focuses on promoting sustainable communities through educational programs and research directed at understanding how the financial, civic and environmental sustainability of local communities can be improved. “This is the single most noteworthy ranking of public affairs programs in the nation,” said David Renz, Chair, Department of Public Affairs, Beth K. Smith/Missouri Chair in Nonprofit Leadership and Director, Midwest Center for Nonprofit Leadership. The nonprofit management emphasis at UMKC focuses on “social entrepreneurship,” agency governance, executive leadership and the role of the nonprofit sector in the economy. Bloch School Dean Teng-Kee Tan reiterated the successes the School has had over the past few years, particularly in entrepreneurship and innovation. “The Henry W. Bloch School of Management’s key mission, vision and value proposition focuses on twin pillars of excellence: entrepreneurship and innovation in the for-profit sector and ‘social entrepreneurship’ and civic innovation in the public/not-for-profit sector,” Tan said. “The rankings Bloch has achieved reinforce the fact we are a top school in both areas.“Entrepreneurship and non-profit ‘social entrepreneurship’ is what the life of our school’s namesake, Henry Bloch, is about,” Tan noted. For more information on Public Administration programs at the Henry W. Bloch School of Management, click here. For the listing of U.S. News & World Report Best Graduate School rankings, click here.